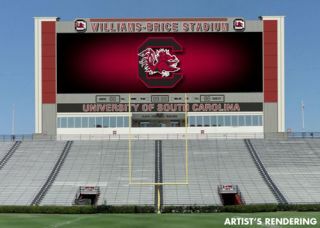 Daktronics will install a high-definition LED video upgrade to Williams-Brice Stadium at the University of South Carolina. Scheduled to be completed prior to the 2012 college football season, the new HD video display will be nine times larger than the current video display it will replace. Measuring approximately 36 feet high by 123 feet wide, the new HD video display will utilize the latest LED technology offering clarity and contrast of video images and providing good viewing angles throughout the stadium. The display will be able to operate independently by showing single large images or be divided into multiple zones (windows) to show a wide variety of statistics, information, graphics, animation and live and recorded video. The display can also be used to recognize and activate sponsors. Located below the video display will be a custom LED scoreboard showing game in-progress information. The new scoring and video system will integrate with existing Daktronics LED ribbon displays located on the stadium fascia. Also included in the project is Daktronics new Show Control system, which provides a combination of control software, data integration, and playback hardware.